To connect an iPod® to the vehicle so that the iPod® can be controlled with the audio system controls and display screen, use the USB port located in the center console. Connect the iPod®-specific end of the cable to the iPod® and the USB end of the cable to the USB connection port on the vehicle. If your iPod® supports charging via a USB connection, its battery will be charged while connected to the vehicle with the ignition switch in the ACC or ON position. While connected to the vehicle, the iPod® can only be operated by the vehicle audio controls. 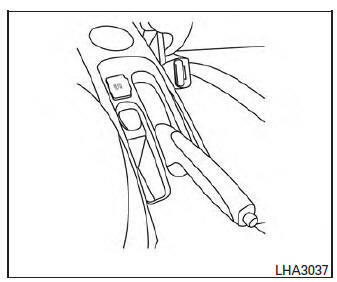 To disconnect the iPod® from the vehicle, remove the USB end of the cable from the USB connection port on the vehicle, then remove the cable from the iPod®. * iPod® is a trademark of Apple Inc., registered in the U.S. and other countries. Make sure that your iPod® firmware is updated to the version indicated above. Place the ignition switch in the ACC or ON position and press the iPod MENU button to switch to the iPod® mode. If another audio source is playing and the iPod® is connected, press the iPod MENU button to switch to the iPod® mode. If the system is turned off while the iPod® is playing, the iPod® will start when the PWR button is pressed. For additional information, refer to the iPod® owner’s manual. scroll through the choices and press the ENTER button to make a selection. Press the BACK button to return to the previous display. If there are multiple folders with audio files on the iPod® device, turn the TUNE/FOLDER knob to change folders. Turn the knob to the left to skip back a folder. Turn the knob to the right to skip ahead a folder. If there is only one folder of audio files on the iPod® device, turning the TUNE/FOLDER knob in either direction will return to the first track on the iPod® device. button is pressed for less than 1.5 seconds while the iPod® is playing, the next track or the beginning of the current track on the iPod® will be played. button is pressed for more than 1.5 seconds while the iPod® is playing, the iPod® will play while fast forwarding or rewinding. When the button is released, the iPod® will return to the normal play speed.